I’ve been waylaid by the flu for the past several days, and it’s been rain, rain, raining! Today though, a few rays of sunshine between the drizzling! I did a play on the traditional Chinese Almond Float. Instead of milky almond flavored gelatin cubes, I made peach rooibos gelatin cubes. And instead of a heavily sweetened syrup, I used lightly sweetened almond milk. Rooibos, an herb tea also known as red bush tea, is grown in South Africa and is thought to be high in antioxidants. It’s also caffeine free, so you don’t need worry if you are caffeine sensitive. This tasted so good going down– like a bright ray of sunshine, bursting through the clouds……okay, I’ll stop. But the plate under my glass does kind of look like a sun, a rainbow sun. It was unintentional– I was just looking for a bright plate to take a nice picture. I think I’m starting to feel better now. In a 9" x 9" glass pan, soak the gelatin in the room temperature water. Steep the rooibos in the boiling water for 5 minutes. Strain the liquid tea into the pan with the gelatin. Add honey, then stir well to make sure all the gelatin has melted and is mixed in. Cool to room temperature. Chill several hours or overnight until set. Cut into ¾" cubes. 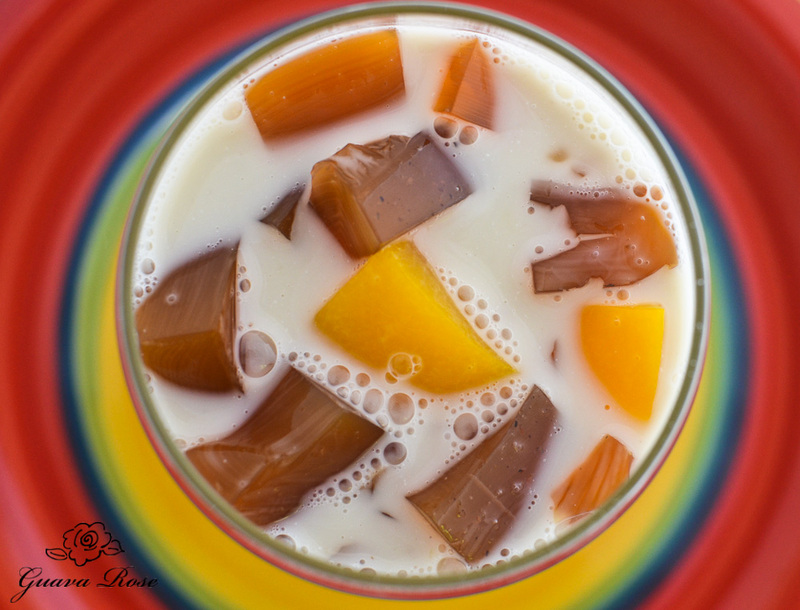 To serve in a big bowl, gently toss together rooibos cubes, peaches, almond milk and almond extract. Keep well chilled. To portion individually, place ½ c. vanilla almond milk mixed with ¼ tsp. almond extract into each of 6 cups or glasses. Add ½ c. peaches and ⅙th of the rooibos cubes. Mix gently. Keep well chilled until served. 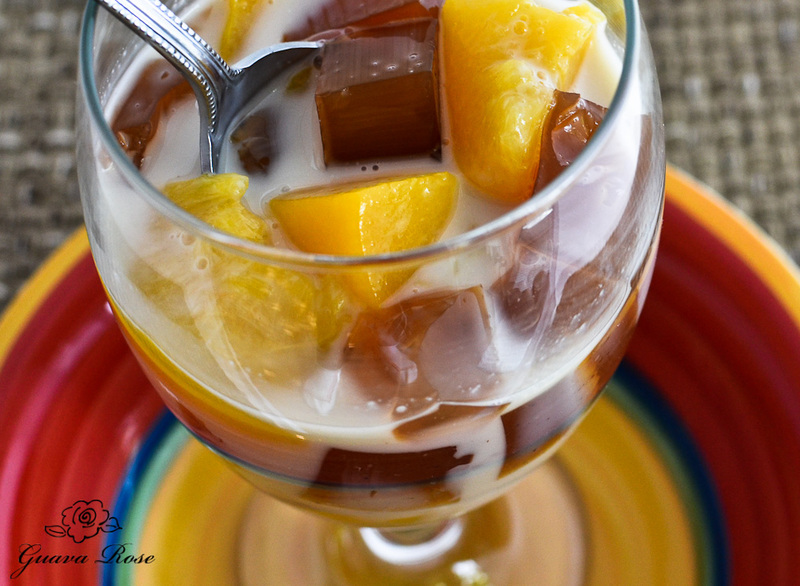 Note: If using canned peaches, the drained juice may be used as part of the room temperature water.